GM boasts that the 2012 Chevrolet Sonic is the only car in its class that's assembled in the U.S. (at a plant in Lake Orion, Michigan). The 2012 Chevrolet Sonic is neither subsonic nor supersonic—but it's a good, sound choice and a world better than the Aveo it replaces. 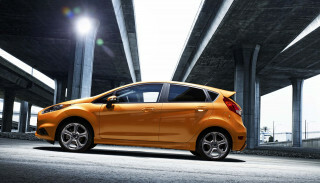 With the 2012 Chevrolet Sonic, General Motors is at last fully in the small-car game. That might sound silly to those who can recall a laundry list of former Chevrolet small cars—Chevette, Vega, Spectrum, Cavalier, Cobalt, Aveo, Metro, Sprint, to mention a few—but most of those vehicles truly felt like halfhearted efforts that took second stage to the automakers trucks and larger cars. That's not the case with the 2012 Chevrolet Sonic, a completely new, global small car that thankfully has nothing to do with the rental-car-mainstay, the Aveo, that it replaces—thus the new model name. At a time when the subcompact class seems to be segmenting into two camps—with the Nissan Versa, Honda Fit, and Hyundai Accent on the larger side, and the Ford Fiesta, Toyota Yaris, and even the Fiat 500 at the lower end of the scale—the Sonic lands mostly in that smaller group, at least by the EPA's definition. 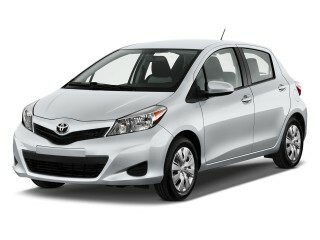 Yet in looking at curb weight (about 2,600 pounds), the Sonic ranks as one of the heavier vehicles in this class. Factor in an all-new structure that feels transformational compared to the Aveo's, and vaultlike next to many other small-car designs, combined with a top-notch safety list (already an IIHS Top Safety pick, five-star federal ratings, and ten standard airbags), and we have no hesitation in calling the Sonic the safest subcompact pick among 2012 models. There are two engines available in the Sonic, and both of them are poached from the Chevrolet Cruze lineup: a normally aspirated 1.8-liter four, or a turbocharged 1.4-liter four. Both can be had with either a manual gearbox or an all-new six-speed automatic. The 1.4T is definitely our favored choice between the two, as it's more flexible as well as more fuel-efficient. Nicely weighted steering rounds out the driving package, and while the Sonic is actually surprisingly good fun to drive, the steering is if anything a little too isolated and damped. That speaks for the rest of the package—which is great, from a passenger and comfort perspective. The Sonic is supremely roomy, comfortable, refined, tight, and quiet for a small car, and it's really hard to find any serious flaws with the entire package—and in our opinion, it looks better than most in this class in sedan form, even though we love hatches. The Sonic delights with surprise standard features like alloy wheels on all models, plus remote keyless entry and air conditioning, and comes pretty well-equipped for around $15k. But then, in this arms race of features and value, there are some disappointments. For instance, you'll need to reach to LT or LTZ models to be able to option to the 1.4T engine, and some tech essentials like USB (with full iPod control) and Bluetooth are optional and only offered on the top-of-the-line LTZ model. That said, a loaded 2012 Sonic LTZ should still total below the $20k mark—a seriously good deal in today's market. For a very affordable, entry-level small car, the 2012 Chevrolet Sonic doesn't look or feel basic or bare-bones. The 2012 Chevrolet Sonic is an all-new, from-the-ground-up vehicle, and while its size and basic proportions aren't all that much different than those of the former Aveo, nicely contoured sheetmetal, a more elegant roofline, and fine detailing throughout give it an entirely different, more upscale (and even somewhat sporty) look and feel. The Aveo sedan adds a few more inches of overall length compared to the hatch, though the front half of the vehicle is largely the same—as is the wheelbase. One other key design difference: while the rear doors in the hatchback are 'hidden' (located up high at the back), those in the sedan are of a more conventional design and location. 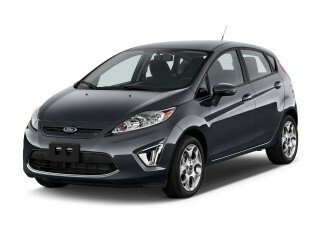 In front and in back, you won't make any mistake in identifying the Sonic; it's adorned with huge Chevy bow-tie badges. But the Sonic takes several other new Chevrolet design cues and amps them up just a little bit; for instance, the dual grille has been moved downward, centered over the front bumper, while the headlights are round, and set in a black background. Likewise, there's more blacked-out trim throughout to help provide crisper lines around the doors and hatch. While the previous Aveo sedan was, in our opinion, the far more homely choice over the hatchback, the new Sonic sedan simply gets the proportions right—appearing from many angles as a somewhat shorter, blunted Cruze, which is not at all a bad thing. The roofline in back, with the sloping rear window and crisp decklid edge (reminding us of the upcoming 2013 Malibu), gives it a nice neat (and not bulbous) look. Especially in the hatch, the upward side crease and shapely creased wheelwells help give it more of a 'hot hatch' look. And shockingly, all 2012 Sonic models, even the base LS, come with alloy wheels. Inside, the Sonic feels far sportier than you might expect for such an affordable vehicle. The Aveo's somewhat cockpit-like instrument panel wraps around to the doors and curves downward into a center console area, enveloping the front seat occupants. There's a new three-spoke steering-wheel design, borrowed from other recently redesigned Chevrolet models, and the V-shaped center stack very efficiently and attractively consolidates audio and climate controls. Front and center for the driver is an all-new instrument cluster, with a digital speedometer and trip meter grouped together, yet an analog tachometer, which altogether helps cement that sporty feel. While materials aren't quite on par with larger, more expensive vehicles, they're better than more budget-priced cars, and you'll find details like contrast stitching for the vinyl (leatherette) seats and contrasting, grained instrument-panel and door surfaces. Subtle chrome rings provide accents, but it doesn't go overboard with the jewelry. The 2012 Chevrolet Sonic has the driving sophistication of a much more expensive car—especially when optioned with the 1.4T. Two different engines are offered in the Sonic—a naturally aspirated, 1.8-liter four-cylinder base engine, and an available turbocharged 1.4-liter four that promises both improved performance and better gas mileage. Both are hand-me-downs from the Chevrolet Cruze, which means that in either case the Sonic has a friskier, more eager-and-responsive feel than you'll find in some other basic, affordable cars. 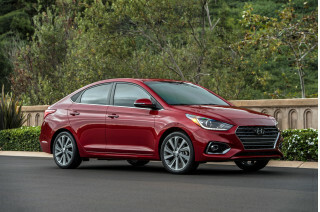 A five-speed manual is standard with the 1.8-liter, while 1.4T versions get a standard six-speed; but in either case, the optional six-speed automatic transmission will be a popular choice. While the power ratings aren't that much different between the two engines, there's a substantial difference in real-world performance. There's also a pretty big difference in refinement between these two engines. While both engines are rated at 138 horsepower, the 1.4T makes 23 pound-feet more torque—and it makes 90 percent of its peak torque all the way from 2,400 to 6,500 rpm, so you often don't truly need to downshift. It's also a very smooth, refined engine and feels a class above. Actually, with the 1.4T, as we found with the larger Chevy Cruze, extra revs above 5,000 or so aren't really rewarded, and the throttle response can be a little too muted. On the other hand, to extract the 1.8-liter's full potential you'll need to rev it up past 4,000 rpm—where it can get noticeably louder and somewhat boomy. The six-speed manual is actually very nice, with relatively short throws and direct, precise shift action, plus very smooth clutch takeup. So is the new six-speed automatic, which we found responsive and quick to downshift while just leaving it in Drive. You can control downshifts with a small plus/minus toggle button at the side of the shift lever. 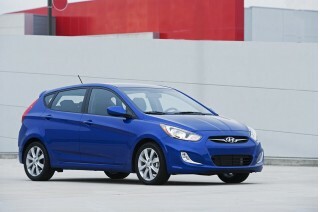 With either choice, though, consider that you'll be shifting more with the 1.8-liter engine. There's a surprisingly capable chassis underneath the new Sonic; while this isn't the type of vehicle that driving enthusiasts would pick, it's nice to know that it does feel controllable, and actually fun to drive, on a curvy road—far more so than most econocars. The only blemish from an enthusiast's standpoint is that the Sonic's steering is more isolated than the steering in the Ford Fiesta, making it less sporty in feel yet less susceptible to vibration and road harshness—no doubt a tradeoff that 95 percent or more of buyers in this segment will be happy with. The one other perhaps more serious offense was that while brake performance was just fine, the pedal feel tended to be mushy. The 2012 Chevrolet Sonic makes good use of its very small dimensions, while comfortable seats and a tight, quiet cabin should make it easy to live with. The former Aveo was always quite good with respect to comfort—a trait that likely helped it earn a popular spot in rental-car fleets. But the new 2012 Chevrolet Sonic covers more than just the basics—with better detail, more cubbies, and a sense of flair. Front and rear seating is virtually the same, whether you choose the sedan or hatchback. Front perches are comfortable enough for a few hours on the highway, and the driving position felt just right for a wide range of drivers—with the protruding gauge cluster (which appears a bit odd and overstyled at first) perfectly placed and very easy to read. In back, this 6'-6” editor was able to fit in the back seat without hunching—a feat that can't be claimed in some cars much larger—although legroom and knee room was very limited. Unless you have shorter front-seat occupants and can really scoot those seats up, you're only dealing with a child-size space. The one major letdown with the package is that the load floor is surprisingly high—much higher than the Honda Fit, which is still the packaging/space champ. However, a rather large underfloor tray opens up some more space at the far back of the car—enough, comfortably, to keep a couple of laptops or a small valise out of sight. One other thing worth noting is that sedans actually have more cargo space (thanks to their extra length); their trunk is 19 cubic feet, versus 14 for hatchbacks, and the seatbacks fold down (flat if you load them and don't have the front seats up too far) in either version. Cubbies are a strong point, with a couple of large bins toward the middle of the dash, along with in the door—although the backseat area lacks storage spaces. One item that bothered us repeatedly is that (as in the Ford Fiesta) the central locking controls are in the center console, in a position that's hard to reach if you've already gotten out of the driver's seat. It can also be a long glance down to the climate control dials, with no display up high to indicate settings. 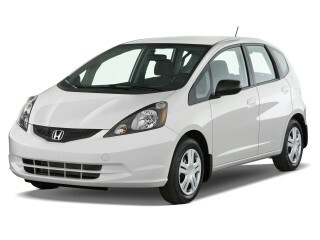 Ride and refinement are top-notch compared to other budget-priced small cars. We noticed none of the little trim-and-panel vibrations that seem par in this class. Road noise in particular seemed very well damped, although in one LTZ model with the larger wheels we did hear irregularities a bit more at low speed. 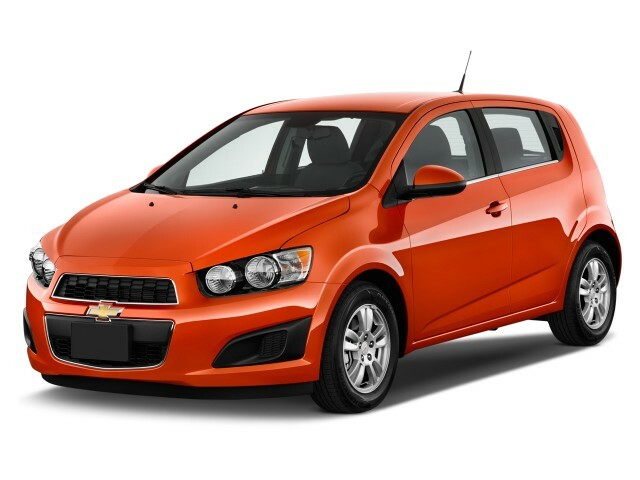 The 2012 Chevrolet Sonic is shaping up to be one among the safest subcompacts on the market. Put simply, if safety is one of your top priorities, yet you want a small car, the 2012 Chevrolet Sonic should be right at the top of your list. General Motors has designed and engineered the new 2012 Sonic on an all-new global platform, intended from the start to provide class-leading occupant protection in multiple markets—which called for extensive crash-testing during its development. 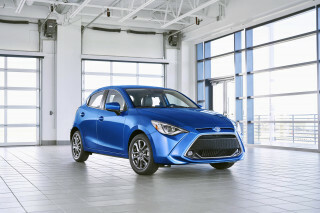 Key to the Sonic's excellent protection is a body structure that's made of nearly 60 percent high-strength steel, and a new engine cradle system that helps disperse frontal crash forces. The Sonic also offers an impressive ten airbags in all, including knee bags for both driver and passenger, as well as child-seat-compatible side thorax airbags for rear passengers. Electronic stability control is included, as are anti-lock brakes with Brake Assist—though it has rear drums rather than discs on all versions. Crash-test ratings are excellent. The Sonic has achieved top five-star ratings from the federal government, and it's earned top results from the Insurance Institute for Highway Safety (IIHS); it's also been named a Top Safety Pick. And in the IIHS roof strength test, which is related to the likelihood of injury in a rollover, the 2012 Sonic managed to withstand more than five times its weight—yielding a top 'good' rating. The 2012 Sonic can be equipped with many of the tech features that always-connected commuters want, but they cost quite a bit extra. With a starting price of $14,495, including destination fee, the 2012 Chevrolet Sonic remains one of the most affordable new models on the market. Yet this time GM has equipped its entry-level Chevy to avoid disappointment; even the base LS comes with air conditioning, power locks, remote keyless entry, and a til/telescopic steering wheel. The mid-level Sonic LT adds a six-speaker sound system plus XM satellite radio, as well as power heated mirrors and driver's side auto-up/down, while the top-of-the-line LTZ gets heated leatherette front seats, cruise control, fog lamps, and large 17-inch alloy wheels. Connectivity is one area where Chevy fails to keep up with many of the other latest models for availability, even if high-end tech features are optional or included on higher trims. A Bluetooth hands-free interface, steering-wheel audio controls, and a USB port for iPod music access are only offered in top LTZ models, as part of a Connectivity Package. The one item that's missing from the options list, for now, is a navigation system—though GM says that will be remedied by the end of the model year. Also, we found the leatherette seats to be every bit as good as the type of leather that goes into inexpensive cars, but it still might not be quite enough for those who absolutely must have their cow. The 2012 Chevrolet Sonic earns a spot in the 40-mpg club—though you have to pay a little extra to get there. 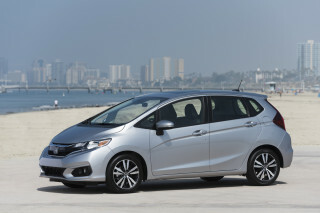 One of the traditional reasons to downsize is to get better fuel economy. But if you get the 2012 Chevrolet Sonic with the base 1.8-liter engine, its gas mileage ratings, surprisingly, aren't that much better than those of a base, mid-size 2012 Toyota Camry. The 1.4T engine, which is a $700 option in LT and LTZ models, gets better ratings of 29 mpg city, 40 highway, although its ratings with the automatic—not available until later in the year—haven't yet been released. Even though that places the premium for the 1.4T Sonic to be about $1,400 more than the base Sonic LS, it's a choice that's likely to pay off in the long run, especially if you're planning to keep the car over the long term or if you were already planning to get a better-equipped LT or LTZ. The 1.4T, unlike many turbocharged engines, has been tuned and engineered to run on regular unleaded fuel as well. On a route that included a mix of city stop-and-go followed by more aggressive driving on winding two-lane roads, we observed that the 1.4T also proves considerably more fuel-efficient in real-world driving. We first managed about 28 mpg in an automatic 1.8-liter Sonic. But in a manual 1.4T in about the same conditions we saw 31 mpg, then 33 mpg in another car, mostly on the highway. While the car is still reliable, as it has aged, the gas mileage has gotten much worse. Fun to drive gas miser.